Yes, I do have a love/hate relationship with products that take the guise of chocolate - but aren't really the world's most perfect food. True, I hated the chocolate magnets. They were too life-like. Really. You could see some poor soul hankering for some Cadbury's going in for a bite and then getting the disappointment of a lifetime. And a broken tooth. 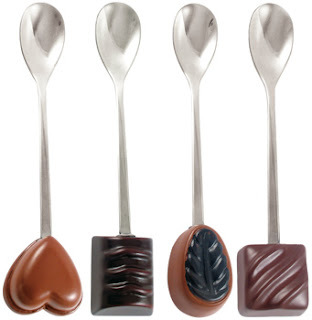 So why the 'rate it' for these dainty teaspoons with the psuedo-chocolate toppers? They're just too sweet! Bon bons with your tea...bon bons with your coffee. They seem to hark back to a time when women sat down in their Sunday finest, entertaining their girlfriends with petit sandwiches, tea and delectable mini cakes & pastries. I know my grandmothers used to meet for tea. I bet sometimes they'd have little chocolates just like these ones - for real. The appearance of these faux candies on the teaspoon tips are just chock full of whimsey and sweetness, and in this hard & fast world, don't we need more of such sugary kindness sometimes?